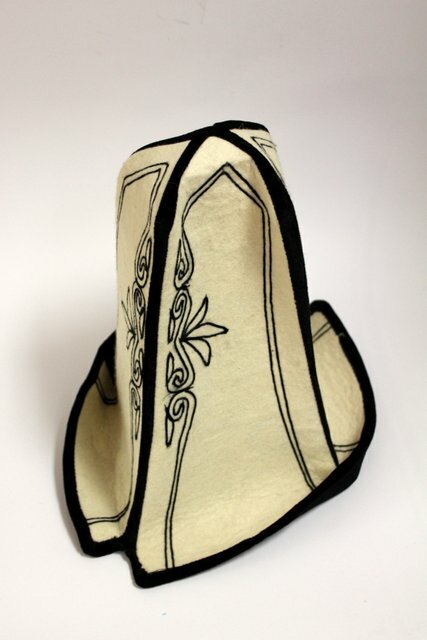 The kalpak or cap is mentioned in ancient chronicles: in the Middle Ages, this headdress with a high tapering upward and sometimes spiky crown was considered an attribute of high social standing among the Turkic nomads; it was common in the southern Russian steppes as well as in the Volga region. In Russia it was also called the klobuk (hood). 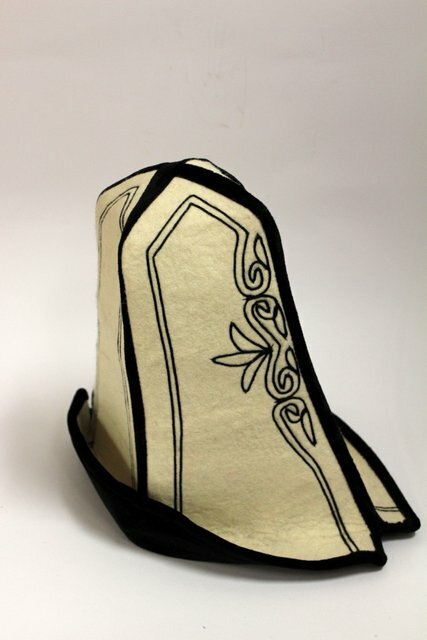 Today the kalpak remains the headwear of the Kazakhs, the Kyrgyz, the Karakalpaks, and (rarely) the Uzbeks of Central Asia; its main material is felt, though the more expensive festive varieties have velvet covering. The kalpaks of the Kyrgyz would certainly have a black lining, forming a flap, and black embroidered pattern on the crown. The name "ak-kalpak” translates simply as "white cap."